You hear the name POTTERSVILLE, and possibly would top that list of 'things Pottersville' that would come to mind. Added to that, the now defunct Potters football teams, soft ball cricket, the St. Alphonsus Roman Catholic Church & Goodwill Parish Hall, the Pottersville Beach, the Pottersville Savannah which served as a venue for cricket, rounders, football, the World Creole Music Festival, Coney Island, of course, BASKETBALL. The official name for this community is Pottersville but the area is also known as Lòdbò and Balaou Town, after 'balaw' - the local name for one of the types of fish caught by the fishermen of this fishing community. Russell Moreau claims to have introduced basketball to Pottersville in the early 1970s, using the circular frame of an old wooden chair nailed on to a Glory Cedar tree on the side of Steber Street (Jump Ball No. 40, February 5th, 2019). The community of Pottersville was actively involved in the sport of basketball for at least 13 years, with its own the 'off-season' basketball league, hosting of national league games, teams participating in the national league and more. So, with the sound of waves of the Caribbean Sea lapping up on the Pottersville Beach on one side, and the sound of the rushing waters of the Roseau River on the other side, let us take a closer look at the involvement of Balaou Town in basketball. National League Teams: To date a total of six (6) men's basketball teams from Pottersville have participated in Dominica's National Basketball League. The first team to come off Balaou Town and participate in the national league was Lakers, and this they did in 1985, competing in Division II (Intermediate Division). Standing around the centre circle and the sides of the 'key' or 'zone' were players such as Delvin Esprit, George Francis, Wilford Joseph, Marshall Durand, T. George, Cedrick Attidore, Kelvin Hector and others. Lakers may have had far fewer victories than defeats, but two of the teams they defeated in the 2-round League in 1985 were Rammers of Grand Bay (64-63) and Keep Fitters of Soufriere, (53-51). Lakers had lost to Eagles 61-88 in the first round, but were blown out by that team, 52-110 in the second round of matches in the League competition. They also suffered defeats against 66ers of Grand Bay, Blue Jays (Fond Colé), Clouds (Goodwill), Shutters (Trafalgar) and Targets of Pointe Michel. The next teams from Pottersville to enter the DABA League were Hoyas in Division III (Juniors Division), and Sharks in the Intermediate Division (Division II); they both made their debut in the national basketball league in 1987, a year which saw Dominica staging the inaugural OECS Basketball Champion-of-Champion Basketball Clubs Tournament. Hoyas III was formed by Marcellus 'Ti-Ling' Lee and Daniel 'Meys' Winston, and was coached by Marcellus. In their first season Hoyas completely overpowered Pioneers – the only Women's team in the national league - by 70 points (98-28). Sharks on the other hand, trounced Castle Bruce 83-29. In Reunion Year 1988, Hoyas brought home the gold to Pottersville basketball, capturing the Division III League Championship and delivering to Balaou Town its first basketball trophy. The seven other teams in that Division that year were Aloe Pops from Soufriere, Stormers (Goodwill), Wolverines (Bath Estate), Prowlers (Trafalgar), Smashers (Grand Bay), and Sharpers and Reefs from Roseau. That year Davidson 'Guinea' Toulon was the 5th highest aggregate scorer in the Division III League competition, sinking in 125 points. Guinea would later go on to represent Dominica on the Senior National Basketball Team and was still playing competitively even up to 2019. 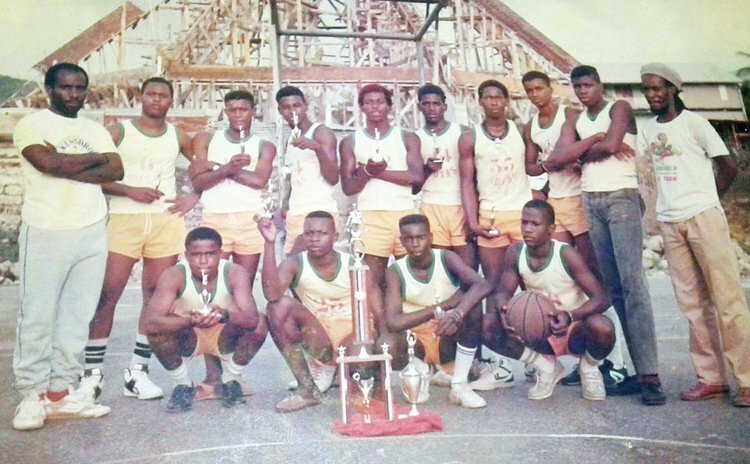 In November 1988 Moreau's Hoyas participated in DABA's first-ever 16 & Under League and Knock-out competitions and brought Pottersville their second Basketball Championship by winning the Knock-out competition. The Under-16 team was coached by Daniel Winston. Other players who played on Hoyas Under-16 and Division III teams included Ian Christmas, Algernon Defoe, Earlston Defore, Caudric 'Pampers' Gustave, Gary John, Jason Joseph, Simpson Lugay, and Fitzroy Moulon, among others. Unfortunately, Hoyas III disappeared from the scene after the 1988 basketball season and the Under-16 League was never held again. Sharks in 1988 placed 2nd in Zone A of the Division II League competition. The seven other teams in that zone were Dominica Community High School, Clifton Dupigny Community College, Raiders from Portsmouth, Wolverines (Bath Estate), Oilers (Castle Bruce), Pros II (Grand Bay) and Sharpers from Roseau. Sharks' Kenrick Lugay and Stanley Stowe were the 5th and 7th highest aggregate scorers in the Division II League competition in 1988, sinking in 101 and 96 points respectively.